On this page you will find information about groups that are working on research that engages the community in a meaningful way or that are faith-based or faith-focused. This is a group that has been meeting to explore ways to bring faith-based community engaged research that is happening in the Chicago area together more intentionally so that we can learn from each other and help support and expand each other’s work. All are welcome. We use an online platform called Nexus to communicate and share information with each other. Sign up and join us at our next meeting! STAR is a culturally appropriate methodology for minority communities to identify, select, & involve researchers capable of engaging communities to conduct Patient-Centered Outcomes Research (PCOR). It is an opportunity for minority communities to be involved in research as never before by selecting researchers who are sensitive to the needs of the minority communities. 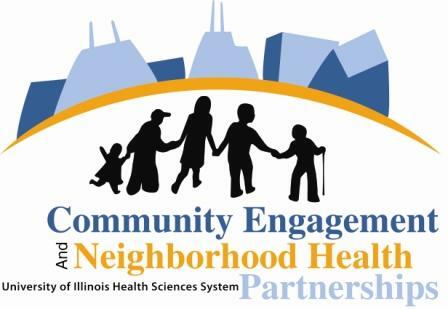 Pastors4PCOR is an integral part of this strategy by developing community-academic partnerships between the universities in the area and the Southland Ministeral Health Network in South Suburban Chicago. See a video describing the project. University of Illinois at Chicago faculty and students are constantly doing research about topics and interventions that make a difference for communities. The point of the research is to inform the community so people can actually use the findings to better understand what is happening, to inform their programs, and to provide openings for them to speak to the university about what is important to them. There are a couple of ways that the University shares this research. Each month, Healthy City features an University Researcher and provides information about their current research in language that regular people can understand. Information about the featured researcher and a “Take-Away” summary is presented. Sharing What We Have learned through Research” provides short summaries of completed research presented in a community friendly format. See the research summaries.